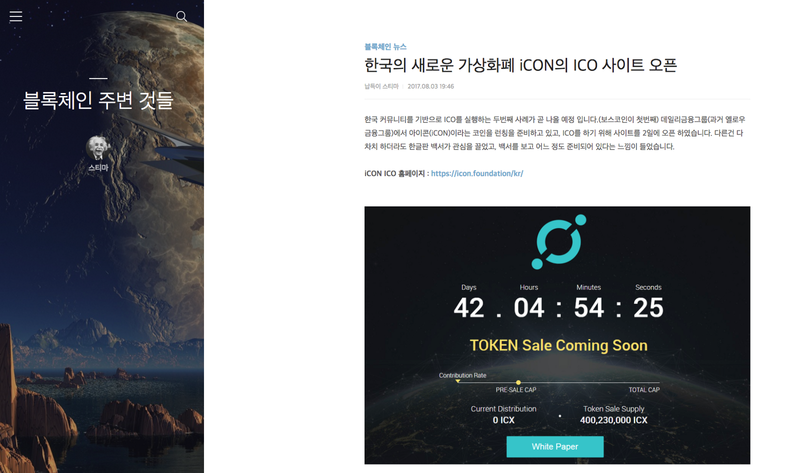 The second ICO our of Korea is coming soon (BOScoin was the first). DAYLI Financial Group (formerly Yello Finance Group) is preparing to launch a coin called ICON. The site was opened on the 2nd. Of all things, the Korea version of the Whitepaper attracted me the most, and after reading through, I felt the company was well prepared. 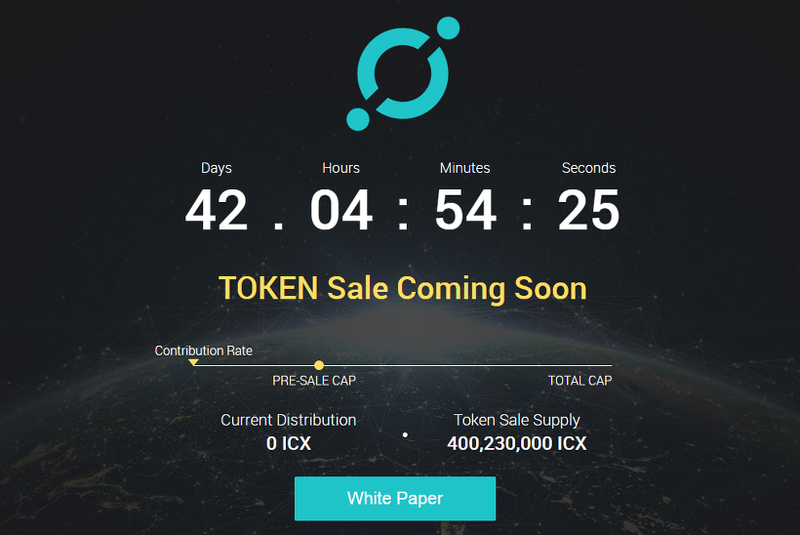 The total number of tokens delivered to a total of 150,000 ETH is 400,230,000 ICX. The Won is 38,175 million won (on August 3 at 19:15 coins per dollar), about 38 billion won. It is quite large. Recently, ICO market is shrinking, but it is remarkable how much it can be procured. The advent of the blockchain technology has introduced the world of decentralization and is challenging our preconceived perspectives of the current social, political, and economic systems, most notably, the central banking system. The rapid advancement of this technology has begun to blend world borders and statute, providing glimpses of an improved, alternative future. Yet, the technology is still at its infancy and is confronted with limitations in terms of performance, ease of use, and service quality. Generally, the majority of blockchain projects place emphasis on their decentralization methodology and lack evidence of adoption in the real world due to their technological and business limitations. The ICON Project (“ICON”, “ICON Network”, “we”, “our”, “us”) aims to overcome such challenges and help advance our society towards true hyperconnectivity. This paper outlines our vision and philosophy of the ICON Project and details on the supporting proprietary technologies that have been in development over the past few years. More importantly, we discuss actual implementation with dozens of reputable institutions that are already in the ICON Network. This demonstrates our progress beyond the initial concept stage and validates our team’s strong execution ability; a major factor that differentiates ICON from the majority of blockchain projects today. ICON is inspired by Gilles Deleuze and Felix Guattari’s rhizome — “the world with no center point and the world where any point is a mere connection to other points.” ICON is a connector of disparate cryptocurrencies with different blockchain governances, and furthermore, a connector of the crypto world to our real world. ICON embraces the new and the unfamiliar, the principle of radical inclusion — accept new ideas and decisions made by the new republic established by ever-changing crypto-to-real world connections. We are in the process of implementing our blockchain technology in various industry communities made up of reputable institutions, including capital markets, insurance, university, and healthcare. Each community has started to embrace the blockchain technology to solve existing inefficiencies and began to recognize the possibilities of expanding beyond respective communities by connecting with other communities. 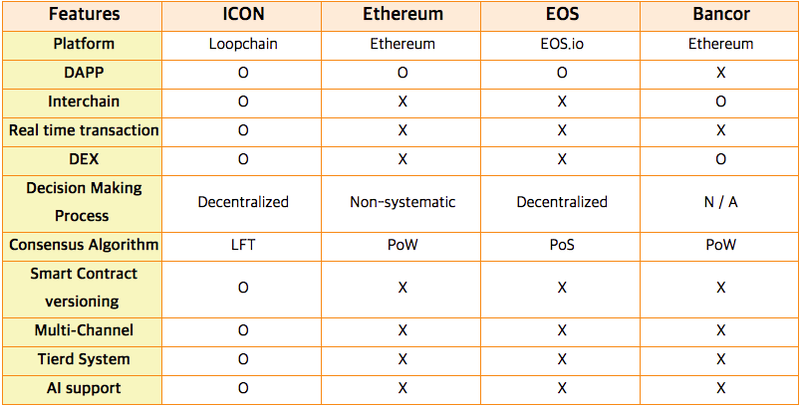 In a sense, ICON is a natural evolution of thriving blockchain ecosystem and is the solution to the need of bridging disparate blockchain communities. ‘Korea Financial Investment Blockchain Consortium,’ the first industry-wide blockchain consortium backed by 25 securities firms, is leading the innovation of domestic capital markets with loopchain, a blockchain technology developed by theloop. The first blockchain service to be launched by the consortium in 2H 2017 is a BSI-based authentication, which enables direct authentication and generation/verification of digital signatures without the third party. The consortium plans to expand its blockchain services to other capital market processes, including post-trading and trading, through SCORE, the loopchain’s smart contract execution environment. As one step closer to real life use, the fact that they began applying to the insurance and college sectors are more realistic than the claims made by other coins. Furthermore, it make sense to me how a separate sub-chain runs within the main chain. I have not read all the whitepapers of recent coins, but I have drawn a big picture of trying to do all of the good stories and techniques. (The original blueprint should draw a big picture.) I am looking forward to seeing how DAYLI Financial Group progresses ICON. For your reference, please also read the blockchain related blogs organized by DAYLI Financial Group.